After being with Tate Publishing for the last 9 years and having two books published with them, they have closed their doors. This means I am in the process of getting a new publisher so it will be some time before you can find either book in stores. For now, you can only purchase these books through me. What was to be a wonderful honeymoon has turned into a nightmare as people are being murdered, and her husband is the security guard’s number one suspect. Join Shelly, Curly, and Tucker in this exciting and fast-paced sequel to A Vengeful Spirit as they track down the real guilty party aboard a Caribbean cruise ship. (14.99 +tx+sh) All orders will take a minimum of 2 weeks. I will email you when it has shipped. (23.99 +tx+sh) All orders will take a minimum of 2 weeks. I will email you when it has shipped. 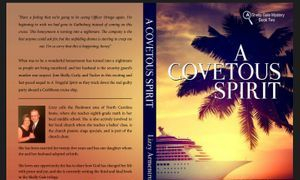 Click the above link to order get a code for the ebook version of  A Covetous Spirit  (7.99 +tx) All orders will take a minimum of two weeks. I will email you the code when it has arrived. Don't have the 1st book in the series? Click the above button to purchase a combo pack. 1 copy of A Vengeful Spirit & 1 copy of A Covetous Spirit. Both will be paperback and autographed. If you are part of any reading clubs or ladies' groups, I would love to hear from you about sharing my book with your group. Please contact me by clicking the "contact me" button to the right. I can come in person or visit through Skype! The phone rang and rang. Finally, she heard someone pick up but could barely hear him speaking. 'Oh, Miss Gale'—he said, his voice interrupted with huge sobs and hiccupping—'please come and help me. There's—' Shelly heard the click of his phone hanging up. Pilotview was a quiet, peaceful town where nothing much happened...until now. As a series of shocking events unfold, Shelly finds herself entangled in the search for answers. Why is someone targeting Tucker's family? What could a twelve-year-old have done to bring such terror to his home? What evil is plaguing the Irvins and turning Pilotview upside down? A Vengeful Spirit is a fast-paced and thrilling suspense novel that will keep readers busy turning pages as they follow Shelly in her perilous quest to uncover the truth. "After getting your book this morning I just laid it down. This evening I thought I would read a few chapters before bed. No big deal. Wrong!! I love your book. Before I knew it I was on chapter 15, and it was midnight. I just don't want to put it down. Great job on your first book. I can't wait to finish it. Hurry up with book #2. " "My daughter doesn't usually read much but she hasn't been able to get her nose out of your book. I haven't even been able to read it because she won't put it down!" "I sincerely enjoyed reading A Vengeful Spirit. Because I have read many suspense novels, I can honestly say this book is one of the best that I've ever read. I was definitely surprised at the ending of the book because I was kept guessing until the very end. I can't wait for the next Shelly Gale mystery!" "As a Christian Murder Mystery, Lizzy Armentrout has produced the perfect balance between all things Christian and Murder Mystery. So many times authors have to sacrifice one for the other - but Lizzy Armentrout manages it perfectly." "It is the twists and intrigues that keep you reading and the resolution you, as with the characters, pray for. Overall, it is a well-written enjoyable murder mystery. (If one can call murder enjoyable!)" When Reagan Ray won a copy of my book on Twitter, I had no idea what that would lead to....she is a book reviewer! She's finished the book and has posted her review & my interview on her site.She loved the book! Just click this link to check it out!